Pick up your rental car at the Launceston City Airport Depot. This morning depart Launceston and commence your drive via Deloraine, Elizabeth Town, Moltema, Sheffield, Gowrie Park and Daisy Dell to arrive at Cradle Mountain. Foodies will enjoy a stop at Christmas Hills Raspberry Farm and Ashgrove Farm Cheese near Elizabeth Town. 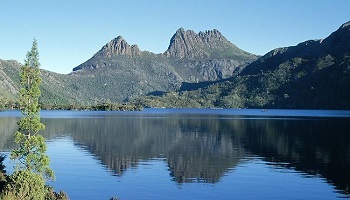 CRADLE MOUNTAIN – LAKE ST. CLAIR NATIONAL PARK is part of the Tasmanian Wilderness World Heritage Area. Enjoy a full day at leisure to experience the spectacular scenery around the lodge and the National Park. Cradle Mountain forms the northern end of the wild Cradle Mountain - Lake St Clair National Park, part of the Tasmanian Wilderness World Heritage Area. The jagged contours of Cradle Mountain epitomize the feel of a wild landscape, while ancient rainforest and alpine heathlands, buttongrass and stands of colorful deciduous beech provide a range of environments to explore. Icy streams cascading out of rugged mountains, stands of ancient pines mirrored in the still waters of glacial lakes and a wealth of wildlife ensure there is always something to captivate you. 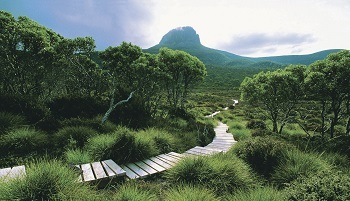 Take a walk through various terrains, from pandanus and wildflowers to Tasmanian myrtle and King William pine forests. Visitors planning to take any of the lengthier walks are well advised to be prepared for changing weather conditions. Depart Cradle Mountain and travel to the Murchison Highway, where you will head south-west, past the towns of Tullah, Rosebery and Zeehan to reach Strahan. ZEEHAN is rich in both history and minerals and the discovery of silver and lead in 1882 saw it become the third largest settlement in the early 1900s. Many historic buildings line the main street of Zeehan and one of the best mining displays and history of the region can be found at the West Coast Pioneers Memorial Museum. STRAHAN, located on the Tasmanian west coast, is the gateway to Franklin-Gordon Wild Rivers National Park - one of the world's most beautiful temperate rainforests. The town is situated on scenic Macquarie Harbour and was a penal colony, until 1833 when the convicts were moved to Port Arthur on the east coast. Ocean Beach, 6 km west of Strahan, is Tasmania's longest beach, 33 km in length. Keep an eye out here for the platypuses inhabiting the small creeks that run to the beach. There is also a muttonbird (shearwater) rookery here in season (October to March). Along this stretch of beach are the Henty Sand Dunes, the largest moving dune system in Tasmania, with guided 4 wheel motor bike tours available. 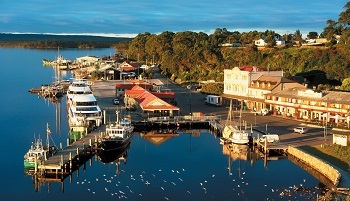 Today is yours to tour Strahan and its surrounds at your leisure. 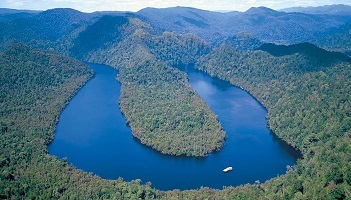 Macquarie Harbour is the departure point for cruises on the magnificent Gordon River - a major sightseeing attraction. (We suggest pre-booking this cruise). In the evening, why not take the Bonnett Island Experience cruise out to a Little Penguin rookery at the entrance to Macquarie Harbour. Centuries of pounding seas have carved out sheltered outcrops on the island, where the birds make their burrows and return home after a day fishing at sea. The experience is provided in great comfort aboard a fast cruiser, departing Strahan in time to go ashore just before dusk to enjoy gourmet local Tasmanian specialties. (We suggest pre-booking this cruise as it only accommodates 10 people). There are some pleasant diversions close to the town. These include the Peoples Park Rainforest Walk to Hogarth Falls, Strahan Historic Foreshore Walkway, Swan Bay picnic area and lookout and West Strahan beach, where there is safe swimming and a barbeque and picnic area. The lookout at Water Tower Hill has fine views over the town and harbour. 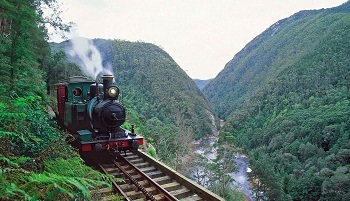 Depart Strahan via the Lyell Highway, travelling past the towns of Queenstown, Derwent Bridge, Lawrenny, New Norfolk and Granton to reach Hobart. LAKE ST CLAIR has an excellent Eco Centre and restaurant. It is only approximately 5 minutes off the highway and well worth a lunch stop. A detour well worthwhile taking today is to leave the Lyell Highway at Lawrenny and travel via Ellendale to the beautiful Mt Field National Park. A major highlight here is a visit to magnificent Russell Falls. Departing Russell Falls, travel via the towns of Westerway and Glenora to rejoin the Lyell Highway at Gretna, and continue on to Hobart. This detour is approximately 75km to the eastern side of the National Park. MT. 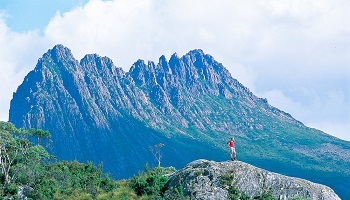 FIELD NATIONAL PARK is Tasmania’s oldest National Park. The striking landscape of the park is bountiful in flora, from rainforest to towering forests of swamp gum, stringybarks and conifers. The bird and animal life is abundant and major attractions are the Lady Barron, Horseshoe and Russell Falls. 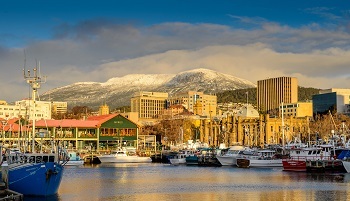 HOBART is the smallest of Australia's state capitals. It is situated on the Derwent River, one of the deepest harbours in the world. The old city centre, with its wealth of colonial buildings, clusters around Sullivans Cove, backed by wooded slopes rising to the often snow-capped peak of Mount Wellington. Its limited size, rich architectural heritage and beautiful setting make Hobart a delight to explore. Please note, each Saturday there is an excellent market at Salamanca Place. 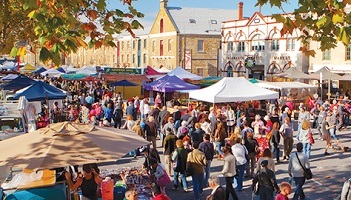 Enjoy a full day at leisure today to explore Hobart and its surrounds. For those interested in the history of Tasmania, the penal settlement at Port Arthur Historic Site is about 100kms from Hobart. 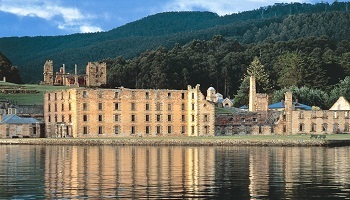 WORLD HERITAGE LISTED PORT ARTHUR HISTORIC SITE is located on the Tasman Peninsula, which is connected by an isthmus of land known as Eaglehawk Neck. It is a symbol of Australia's 19th century convict system. The settlement operated from 1830 to 1877 as a timber producing sawing station, and later as an industrial prison. After the closure, most of the land and buildings were auctioned off, with new residents renaming it Carnarvon township. Following bushfires in 1895, the old settlement has now been restored and is today, Tasmania's premier historic site. Consider combining your visit to Port Arthur Historic Site with a 3 hour wildlife/eco cruise along the spectacular coastline or a visit to the Tasmanian Devil Conservation Park. Other natural attractions on the Tasman Peninsula that should not be missed include the Blow Hole, Tasman's Arch and the Devil's Kitchen (unusual coastal rock formations). In the evening, you can attend "Ghost Tours" where you walk around the settlement with a guide who tells of all the ghosts who still "live" in the area!